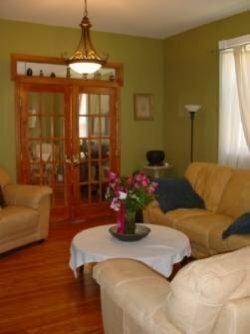 Welcome to our selection of holiday rentals in New York. Did you know that New York was the first state to require license plates on cars? And that it was the US capital for some years? It still retains its number one position for first time visitors. And rightly so as there are lots of things to do and see in New York. First off is the Statue of Liberty on Liberty Island. A must see for all visitors. Symbolizing freedom, it is a gift from the people of France. From here, you can head to the South Street Seaport to soak in the sun while enjoying the street performers and do some shopping. Who has not heard of Wall Street? It was the first permanent home of the New York Stock Exchange and architecturally, is a very interesting structure with columns and decidedly Greek in nature. While here, make sure you visit the Charging Bull located in Bowling Green Park. If you just want to wander around and do a bit of shopping, head to Soho. The wrought iron work on the buildings is quite fascinating to look at. Head to the Intrepid Sea-Air-Space Museum to see a US navy aircraft carrier up close. Central Park is easily the most famous park in the world. You can rent a cycle if you like and go around the park at your pace. Of course, there are guides who are quite helpful and informative. Weather permitting, boating is available for you to enjoy a nature trip in the heart of New York. Should you feel so inclined, you can also hire a horse to take you around the park. There is also a Central Park Zoo that houses seals, polar bear, monkeys and birds. Those who like theatre will definitely have a whale of a time in The Theatre District. Even if you aren�t, you cannot visit New York and not see at least one play. There are many theatres that put up plays and musicals. Most of the leading lights of theatre have performed here at one time or another. After this, you can go to The New York botanical Garden to relax and enjoy the many varieties of flowers. Head to the �Top of the Rock� at the Rockefeller Center to get an aerial view of New York. After leaving the noise of the crowd and vehicles behind, it seems almost heavenly to see the city spread out below with absolutely no sound to mark its beauty. And if you happen to visit during the first Sunday of November, be sure to catch the famous New York Marathon. Please see below the available holiday rentals in New York. The Statue of Liberty is one of the world�s most recognisable monuments. A gift from the French in 1886, the statue is a symbol of liberty and democracy. Visitors can take a trip to Liberty Island and enter the statue; special tickets are available to climb to the top of the statue and look out from the crown. The Empire State Building is one of the world�s most famous structures. Visitors can go up to the 86th or the 102nd floors and look out of the observatories here which offer stunning views of New York that few other places can offer. Another of New York�s world famous attractions is Times Square. Known as the �crossroads of the world� Time Square is littered with glitz and glamour, with a range of places to visit. Madame Tussaud�s are the world famous wax museums of which there are several located around the world. Madame Tussaud�s in New York offers a range of life-like wax figures of famous people including Nelson Mandela, Barack Obama, Brad Pitt, Angelina Jolie and Marilyn Monroe. The Central Park Zoo makes for an interesting place to visit with various animals and attractions to enjoy. One of the zoo�s best attractions is the rare Snow Leopard but there are also Sea Lions and Polar Bears. Chinatown, located in Manhattan is one of the largest and oldest in the western hemisphere. There is a traditional Chinese market, a cinema club showing Chinese and American films and during Chinese New Year the streets are filled with partygoers. Chinatown also hosts various other festivals throughout the year. Little Italy was once the primary centre of New York�s Italian population. Today little Italy is filled with Italian restaurants and stores. Each year Little Italy hosts the Festival of San Gennaro as a celebration of Italian Culture and the Italian-American community. The Long Island Aquarium offers a range of exciting attractions including the Shark Dive in which visitors a lowered into the water in a protective cage while ten sharks come close enough to touch. Other activities include snorkelling and being kissed by a Sea Lion. Zoom Flume Water Park is the number 1 family waterpark in New York. The park offers a wide range of rides and slides to enjoy including; the Wild River Ride, which is a raft ride through a 600ft chute, a wave pool, lazy river and the Black Vortex, a twisting turning ride in total darkness. Funplex is a family fun park with Go-Karts, Mini Golf, Rock Wall, Bumper Boats and even a �Spaceball� in which riders are strapped into a seat and spun within a pair of hoops for an interesting, fun and unique ride found in few other parks. This is the largest adventure course of its kind in the United States. The courses are suspended in the treetops with rope swings, cargo nets to climb, zip-lines and wobbly bridges. There are separate courses for children and more advanced courses for adults so all the family can enjoy a treetop adventure. Located in central New York is a natural wonder that must be seen. Secret Caverns is an underground cave system with waterfalls breaking through for stunning sights seen in few other places. Tours are available regularly throughout most of the year. America�s oldest state park is that of Niagara Falls. The falls attract millions of visitors each year and there is a restaurant on top of the falls offering dining with stunning views. At night the falls are lit by stunning lights from behind the water, turning the falls into a moving lightshow that is a must see. New York has a range of airports. In New York the major international airports are the JFK International Airport in NYC, which is New York�s busiest airport, Laguardia international Airport, Albany International Airport and the Buffalo Niagara International Airport. The state has a range of other regional airports. New York�s major cities are Albany, which is the state capital and New York City, the largest city in the state. Other large cities include Buffalo, Rochester and Yonkers. The Climate in New York is diverse with warm summers and cold winters. Summer temperatures can reach well into the high 20s C and winter temperatures can drop well below freezing and are often accompanied by heavy snowfall. New York is located in the northeastern United States. The state shares borders with the states of New Jersey, Pennsylvania, Connecticut, Massachusetts and Vermont. New York also has a coastline on the Atlantic Coast and shares a maritime boarder with the state of Rhode Island. Along its northern and northwestern boarders is the Canadian provinces of Quebec and Ontario respectively.